I’ve written before about the problems of burnout, but gee, the topic is still relevant because those problems don’t go away. In fact, if we don’t deal with burnout, the problems are likely to get worse. As writers, we can burn out in many different aspects of our lives. We can experience it personally, day-job professionally, writing-wise, publishing-wise, or all of the above. We might become sick of our story during drafting or editing. During drafting, we can be discouraged by slow progress and feel the temptation to shove the story into a drawer. Likewise, the revising and editing process requires us to read through a story multiple times, and by the time our editing is done, we may hate our story. Don’t worry, this is normal. To-do lists can threaten to drown us not just in the publishing world but also in the rest of our lives. In our writing world, we might have lists of goals for word count, revisions, submitting to agents, finding a cover artist, release day, promotion efforts, etc., etc. But we also all have personal lists or calendars for our normal day-to-day tasks and deadlines (and maybe our day job too). It’s not unusual to get so overwhelmed or pulled in so many directions that we don’t know where to start, and thus we make no progress at all. Between negative feedback, rejections, bad reviews, and low sales, there’s no shortage of discouragement in a writing career. We can easily think that if we don’t feel a compulsion to persevere every day, maybe we’re not “cut out” to be a writer and should give up. But having a bad day or month or decade doesn’t determine what we’re allowed to do tomorrow. We’re allowed to take breaks, recover, and choose to get back to our goals later. When we first start writing, we’re faced with a huge learning curve. And with few ghost-writing exceptions, we’re solely responsible for learning the craft (because Matrix-style mental downloading of expertise doesn’t yet exist—darn it!). As our learning process progresses to the other stages of publishing, we might keep the same expectations of what we “should” do and resist asking for help, even though help is not only available for later stages (self-publishing, promotion, etc.) but is often essential (beta readers/critique feedback) for our success. Advice is all-too-eager to tell us everything we “should” be doing (“Write every day!” “Attend this marketing webinar!” “Participate in this Twitter pitch party!”), leaving us feeling like a failure when we inevitably fall short. Every so often, writers debate how important fast writing is to success. Some authors try to release a book every few months (or even one a month) to stay relevant and active in readers’ minds. But while we might be able to keep up a punishing schedule for a short period (such as the word count goals of NaNo month), that’s not sustainable over the long term. Unless we have no passion for writing and are just in it for the short-term money, it’s better to come up with a sustainable long-term plan for our career schedule. People are always going to want more from us than we can give. Whether we get requests to lead an event an our kid’s school or to beta read for a fellow writer, there’s no shortage of people asking for favors from us. Writers often talk about the problem of writer’s block, stuck on a blank page and unable to think of what should come next. Or we might feel like we used up all the words and ideas in our head—especially after a big push, such as with NaNoWriMo. Either way, our creative well can feel dry, leaving us bereft of ideas. Writing is art, and sometimes we need to replenish our well of creativity. Whatever the source, it’s normal for writers to feel burnout. We shouldn’t feel guilty for such a normal experience. We have permission to feel—without shame—discouraged, unmotivated, or that it’s hard to measure up. For writers, burnout is far too common, but we can work to fix it. Click To TweetBut for all its normality, we don’t want to accept that burned-out status forever. We want to establish realistic expectations to escape feeling like a failure. At the same time, we have to deal with our burnout because our burnout won’t fix itself. And unless we take action, our burnout will prevent us from accomplishing as much as we could. Obviously, it does no one any good to bury our potential under mental charcoal. So we also have permission to take action to fix our burnout—even if the action affects others. Sleep: Deep sleep is most helpful. Replenish the Words: Do activities that fill us up again and give our muse new ideas, such as reading for pleasure, watching TV/movies, or listening to music. Exercise: Get the blood moving. Explore Other Creative Outlets: Gardening, painting, etc. Be Mindless: Wash dishes, do laundry, vacuum, etc. Change the Scenery: Try writing in a different location: at a cafe, in a park, etc. Rediscover the Passion: Remind ourselves why we want this career, such as by rereading the story that first made us want to be a writer or by reading one of our own stories for pleasure. Resolve to Cut Back: Sometimes our dread of upcoming stresses makes us feel burned out before we even start. Try eliminating some of those stresses. Take a Vacation: Ditch the kids at the grandparents for a weekend for a stay-cation or get away and have new experiences. Identify Our Blocks: If we’re feeling negative about doing writing of any sort, there’s usually an underlying reason (resentment, self-doubt, depression, etc.). Evaluate Priorities: Are we happy with our current path, or do we need to change our approach? Are our deadlines the career equivalent of busywork, or will they help us achieve our goals? But sometimes long-term chronic problems cause long-term burnout that can’t be helped by those types of solutions because the problem is ongoing. We can feel drained before we even start—simply because there is no end in sight. In the case of long-term burnout—in addition to prioritizing self-care, changing our definition of success, and touching base with our passions as much as possible—we likely need to make permanent (or semi-permanent) changes to our priorities and schedule. Those of you who follow my blog know that most of 2016 and 2017 were a struggle for me. My health was a huge factor in that struggle, as I fell victim to not one but two(!) antibiotic-resistant infections, needed surgery to undo a year’s worth of work on my jawbone after a second failure, and suffered dozens of setbacks. Between my insane publishing schedule in 2015 followed by a year and a half of health issues, it’s been nearly impossible for me to avoid burnout—in every “flavor” listed at the top of this post. Depression has lurked in the wings of my mental attitude for far too long, and the spoon theory has become far too relevant to my life. Solving the problem of long-term burnout requires bigger changes. Click To TweetAs I mentioned in my post about chronic problems and burnout, part of my burnout has centered on my blog, as it takes a lot of hours every week. Given my tendency to write long 2000+ word articles, each post takes me 5-8 hours, often forcing me to shortchange my sleep, which then negatively affects my energy the next day. In other words, each post takes a day to write and, far too often, a day to recover. 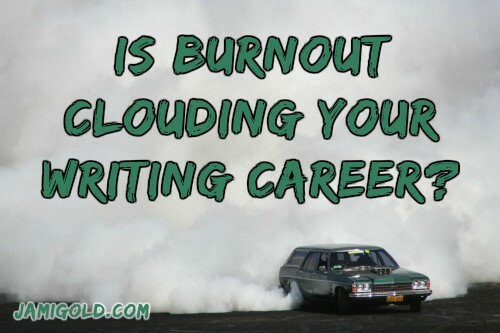 With my burnout, that means most of my productivity writing-wise has been taken up by my blog, and I haven’t been able to focus on fiction writing nearly enough. So I’ve been trying to figure out for about a year how I can reduce the amount of time this blog takes from me. For the past 7 years and 10 1/2 months, I’ve been posting new content twice a week—every Tuesday and Thursday. Between the actual writing and the lack-of-sleep recovery, that eats up 4 days a week. Again, not a surprise that I’m burned out. As a teacher at heart, I love sharing what I’ve learned, so this isn’t about me wanting to quit blogging entirely. (I have too much to say! *grin*) I just want to reduce the time I spend on my blog by limiting myself to Thursday posts that require fewer than 750 words of new writing. Have you ever suffered from burnout? What style(s) of burnout did you suffer from? Can you think of different styles of burnout? How did you deal with your burnout? Do you have advice to add? I think it’s wonderful you’re reevaluating, and finding a way to still share with all of us without it being as much of a drag on your health. You need your spoons! I’m actually glad you made this decision, because (1) I want you to take care of yourself, and (2) I want you to write more stories! There’s so much fabulous content on this blog that people could easily spend a lot of time in your archives and learn so much. Thanks for all you’ve done to support fellow writers! Wishing you all the best. Thanks for sharing this Jami. You’re not letting us down in any way! All the blogs you’ve done so far are still there, waiting to be rediscovered. I had a breakdown at the end of last year, which I now recognise as burnout. I had no energy left (It’s so hard to explain the ‘no more spoons’ feeling! It’s not just ‘tired’ it’s just completely out of energy!). I made some fairly big changes in my life and refocused around being there for my kids. I also got some professional help – just making the call to ask for mental health support helped. Things are slowly improving. Sorry to hear this Rhoda, I have enjoyed your books. Do take care. Remember how important you are to your family. I’m very proud of you. I’ll be honest, I’ve worried about you and your health for a while now. I am glad you’re taking steps to keep yourself healthy and still doing what you love. I am always at your disposal should you need anything. Much as I admire your blog work I agree you are doing too much and should take more time while reminding us of the great posts in the archive. Personally I find using something like twitter – which I don’t use myself – or anything with a short attention span requirement, translates to writing a book of many very short chapters and no beauty. For this reason I do not recommend twitter or instant games or social feeds for writers with burnout. A better idea for me is a strategic game or a long walk. Don’t worry about “letting us down”! Everyone deserves to rest, and you do SO MUCH work! Though I’m in school, I probably do much less than you do, but I need to cut down on my writing workload too. A good friend of mine recently had to take a break from several responsibilities, including passing on a leadership position to others, because he was also burned out. It’s not enough to be an energetic and enthusiastic person. In the end, you are still human and can’t stretch yourself so much for so long. It’s important to learn to take care of our own needs, and to let go of the guilt of “disappointing others”—this is a lesson I recently had to learn too. Yeah totally, blog writing, though fun, takes away so much time from writing. Lately, I wrote a writing tag post for fun, and gosh, it took more than 6 hours (spent three hours finding and inserting GIFs, LOL!) But it looks like that amount of time is normal, haha. I’m in my summer holidays, though, so I’m *supposed* to have more time. Yet, I really want more time to work on my WIP, so I’ll have to work something out. Amen to having more realistic expectations, and that they are not defeatist! I’m trying to set more realistic goals for myself too. Blogs can take a long time to take care of. I’m guilty of doing too many things for others and losing time for the things I want to do. Lately, I feel I don’t have time for much of anything. Thanks for this message. It’s time I take back my life! Thank you for a most enlightening post. And boy, do I feel your pain. Last year I wrote and published 5 novels, took two long trips (one in US, one to Germany), and had 3 surgeries – the first I’ve ever had in my life. This year I have done nothing but emulate a sloth. I have been writing on a novella, but just because I have a contract and a deadline. Not much of anything else, save my long-standing blog commitments. I spend a lot of time out in the hot tub, just thinking. I’ve even coined a new word for this deep-seated lassitude – slothing. It’s almost scary how much I like it – so much that I am toying with the idea of retiring. I have even taken the sloth as my spirit animal! We’ll see what happens.